"We don't do this for our first name, we do this for our last name!" Honor up! 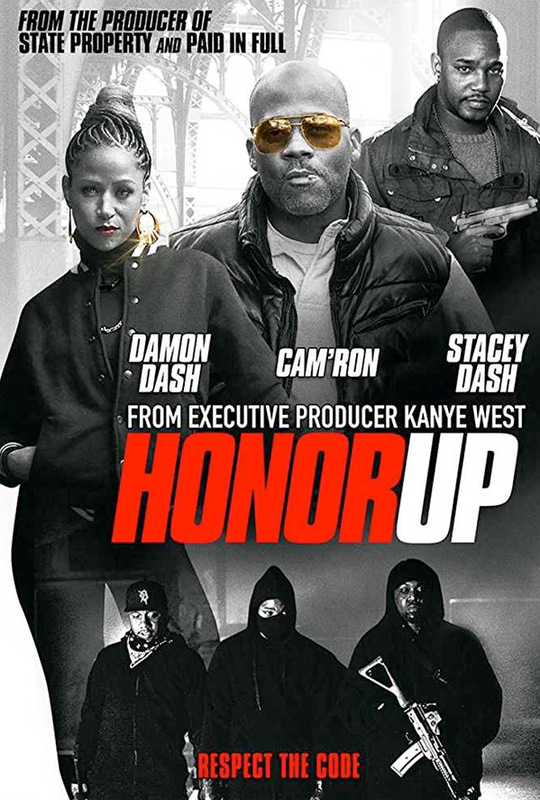 Lionsgate has released the official trailer for a crime saga film titled Honor Up, the latest film from writer/director Damon Dash (of Paper Soldiers, Death of a Dynasty), which is executive produced by Kanye West. Damon Dash also stars as OG, a drug lord's lieutenant from Harlem who is trying to maintain the code of honor — protect the family — within his unruly crew after a Harlem shootout. The full cast includes Stacey Dash, Cameron Giles, John Ancrum, Daniel Jenkins, Smoke DZA, Murda Mook, and Blackface. This looks like a gritty crime drama about staying true to your family, protecting your friends, and never ever snitchin'. See below. State Property producer Damon Dash and executive producer Kanye West present this epic, explosive crime saga that stars rappers Cam’ron, Murda Mook, Blackface, and Smoke DZA. Dash stars as OG, a drug lord’s lieutenant struggling to maintain the code of honor — protect the family — within his unruly crew after a Harlem shootout. Also featuring Nicholas Turturro and Stacey Dash, this film reveals a deadly underworld where beats pound as bullets fly and even outlaws must live by the code. Honor Up is directed by former rapper-turned-filmmaker Damon Dash, of Paper Soldiers, Death of a Dynasty, and State Property: Blood on the Streets previously. The screenplay is written by Kevin Bennett, Damon Dash, Stuart Acher, James Dubose. Lionsgate will release Honor Up in theaters starting February 16th. Anyone?